The Peugeot RCZ with its ‘double-bubble’ rear windscreen and sweeping silver roof rails is not the typical car you would expect to see on the motability scheme, but not all disabilities result in reduced access to low slung sports cars, so lets roll with it. The RCZ is a cracking looking car, from a school boy perspective it just looks fast, you want to peer through the window to see what it looks like inside and imagine yourself behind the steering wheel, but don’t just take our word for it Top Gear awarded the RCZ with ‘Coupe of the Year’ award in 2010. The RCZ started life as a 308 concept car at the 2007 Frankfurt show where it received a glowing reception from the press, so after one one too many Crème de menthe’s at the Peugeot Christmas party the ‘grand framage’ (sorry about this) decided to put the car into production using the chassis from the 308 and let the designers go a bit crazy with the rest of the car and the result is a wonderful looking car that happens to drive very well. From the Sport and GT versions of the RCZ only the Sport model is available to Mobility car customers and as you would expect in a Peugeot the level of refinement is excellent: 18″ alloy wheels, Bluetooth connectivity, Dual zone automatic air conditioning, rear parking sensors, twin exhausts, led running lights, an active rear spoiler that pops up at over 53 miles per hour, cruise control and automatic wipers and lights. The only thing missing as a standard fixture is a Sat Nav which is a £735 extra. Two engines power the RCZ, a 156 brake horse power 1.6 litre petrol engine and a two litre diesel that delivers 163 bhp, performance of the two engines is similar and both are eager to please, performance is brisk rather than fast, 62 miles per hour is achieved in 8.3 seconds for the petrol and 8.7 seconds for the diesel and both have a top speed of over 130 miles per hour. from a sports car we like our power to be in the top end of the rev range so the petrol engine is our choice but the diesel has the edge on economy at 53 miles per gallon against 44 for the petrol, both cars have an excellent 6 speed manual gearbox, only the petrol is paired with a 6 speed automatic which sees the performance drop to 9 seconds and economy to 38.6 miles per gallon. 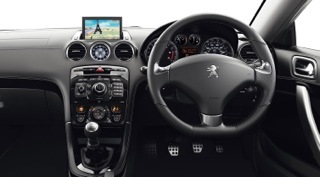 The Peugeot RCZ is an incredibly capable and desirable car that has very few notable faults. The rear practicality is a bit of an issue, and it’s not the dynamic benchmark for the class. However, the Peugeot still rides well, is enjoyable to drive and just looks fantastic.